As the clock ticks and retirement looms, millions of Americans are worried. Thanks to a combination of overspending, undersaving and damage caused by the recent financial crisis, too few have saved too little for their golden years. The crisis has also caused retirement planning to be less of a priority for most citizens who are trying to make ends meet. Alfonso Canella says the resulting retirement crisis should be obvious to everyone. The senior lecturer at the Brandeis International Business School in Waltham, Mass., says most workers will build their retirement on the principal of their savings, not on investment returns. Retirement planning should not be pushed to the bottom of your to-do list. His message is that people must start saving immediately and must squirrel away more than they think they will need. As he says, "It's that simple." The recent financial crisis has had a major impact on all aspects of the retirement system -- defined contribution plans, such as 401(k) plans, as well as defined benefit plans, or pensions. What is most problematic from your point of view? Despite this significant tax advantage, most people don't maximize their contributions or, for that matter, even contribute. According to Fidelity Investments, its average 401(k) plan balance as of June 2012 was $72,800. If you use a rule of thumb that you must start with about $100,000 to get $5,000 per year in sustainable income during retirement, these savings are not enough. While many have additional pension income coming to them, be it from Social Security, individual retirement accounts, or some other plan, the numbers underscore what we all suspect: Americans are not saving as much as they should, especially for retirement. The situation is somewhat similar for public-sector workers. These workers usually have a defined benefit plan, or DB, which pays benefits based on salary and length of service. In many cases -- too many, actually -- these workers face some underfunded pension plans. According to Boston College's Public Plans Database, the average funded ratio across all public plans in the U.S. in 2010 was about 77 percent. This ratio, which summarizes how much has been put away as a percent of projected payouts, summarizes the shortfall. How can individual investors get ahead? Should they change their asset allocation strategy? How should they allocate their assets among stocks and bonds? As I said previously, it is clear that workers must start saving as much as possible, especially taking advantage of tax-driven plans such as 401(k)s, IRAs and Roth IRAs. Let's face it: In these volatile markets, you will retire mostly on the principal of your savings and not because you made a killing in your investments. These investments should be diversified across asset categories -- equities, bonds, foreign investments and real estate (this being mostly one's home). Within these asset categories, there are different risk levels. Some equities, usually in new industries or in young companies, have more volatile returns than equities in more traditional industries or well-established companies. Over time, these investments should be changed to lower risk as the investor approaches retirement and into retirement itself. To help out on this, most asset-management firms have target-date funds that are now popular. Mind you, they are not risk-free, but they make it easier to decide how to invest one's savings over time. What are your thoughts on public and private pensions? Which is in worse shape? Private sector corporations have moved steadily from DB to DC, but I do not expect DB plans to disappear completely (see graph below). 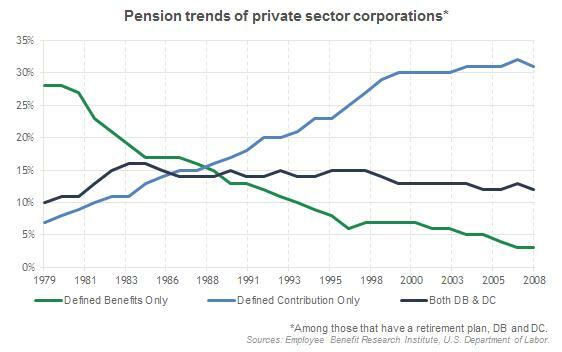 While corporations that moved to DC have managed to cut per-worker pension expenses, many corporations still have a mix of plans. That said, if I were a young worker today, I would not count on a DB plan, especially in the private sector. In the public sector, I would expect to contribute more for a smaller payoff than more senior colleagues. Regarding which is in worse shape between public and private pensions, I would say that public pensions are worse off, but only for some plans. As the Boston College database shows, there are many public pension plans that are properly funded. Still, the overall funding averages show significant underfunding. Private pensions are also underfunded, but with these workers can increase their retirement contributions to catch up with their targeted savings. Have you seen Iowa Sen. Tom Harkin's proposal for a new hybrid pension plan to help solve the retirement crisis? What do you think of it? I like it. It's a good and sensible proposal. The "USA Retirements Fund" system that Sen. Harkin describes is already available in other countries, and it should be implemented here. Mind you, it will not solve the problem of undersaving, but it is a step in the right direction. Recently in the media, big-name money managers, such as Bill Gross and Robert Arnott, have made pessimistic forecasts about the economy and/or stock market. What should Americans take away from this? As I said before, the bulk of your retirements will eventually come from the principal of your savings, not from making a killing in the markets. As to the future of markets, I am not pessimistic, but I will admit that they are getting harder to forecast with any certainty. No matter what one thinks of the markets, though, the key take-away is to start saving now, save more than you think you will need, and take advantage of the tax-related plans. It's that simple. We would like to thank Alfonso Canella, senior lecturer in the Brandeis University International Business School in Waltham, Mass., for his insights. Questions for this interview were contributed by Barbara Whelehan, assistant managing editor for Bankrate.com.